Car sunshades helps protect from strong sunlight, UV, heat and glare. 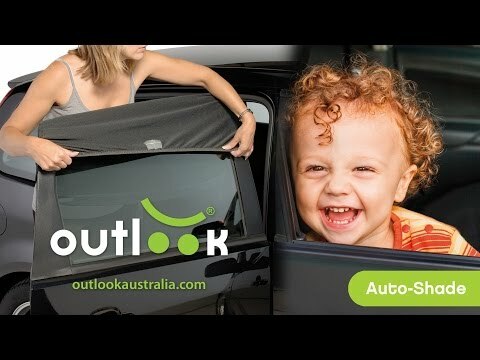 Outlook Auto Shades screen up to 90% of harmful UV rays with UPF 10+ rated fabric. Windows can be raised or lowered for ventilation with the Autoshade car window fitted shades. Car shades attach easily leaving no residue or marks on the vehicle. Multi-fitting shade design offers 2 models available (rectangular or curved). The unique pull down strapping device ensures the shade never "rides up" unlike other similar products. The unique design that covers the entire window on the inside and only the top of the outside allows for greater vision for drivers and passengers. Recommended by the Skin and Cancer Foundation Australia. Easy to fit & Remove – Simply slip over top of door frame, hook under car door and adjust strap to achieve a snug (but not tight) fit.